While in Washington DC last month, Susan was delighted to visit the once-in-lifetime exhibition Colorful Realm: Japanese Bird-and-Flower Paintings by Itō Jakuchū (1716-1800.) Celebrating the centennial of Japan’s gift of cherry trees to the nation’s capital, this exhibition featured one of Japan’s most renowned cultural treasures, the extraordinary set of 30 paintings on silk scrolls by Itō Jakuchū. 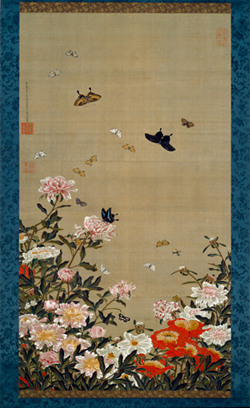 Painted between 1757 and 1766 and donated by the painter to the Zen monastery Shōkokuji in Kyoto, the scrolls entered the Imperial Household in the 1889 where they were displayed in part on special Imperial occasions. Exhibited together only once before and never outside of Japan, these nature paintings detail hundreds of varieties of seashells, fish, birds, insects, reptiles, flowers, trees and leaves with breathtaking colors and compositions. "Teeming with transcendent life" the New York Times stated. An inspiration to all viewers...and painters!